I have nonetheless embarked on a low histamine diet. Note that there is no way to be on a no histamine diet, as all food contains histamines, some more than others. And two of the highest histamine foods are chocolate and red wine (arguably my two favorite foods). This means no chocolate chip cookies for me. And I have switched to white wine (in moderation). What is a girl to do? Create a new recipe, of course. Here is a cookie recipe that I have been perfecting for the last two weeks. 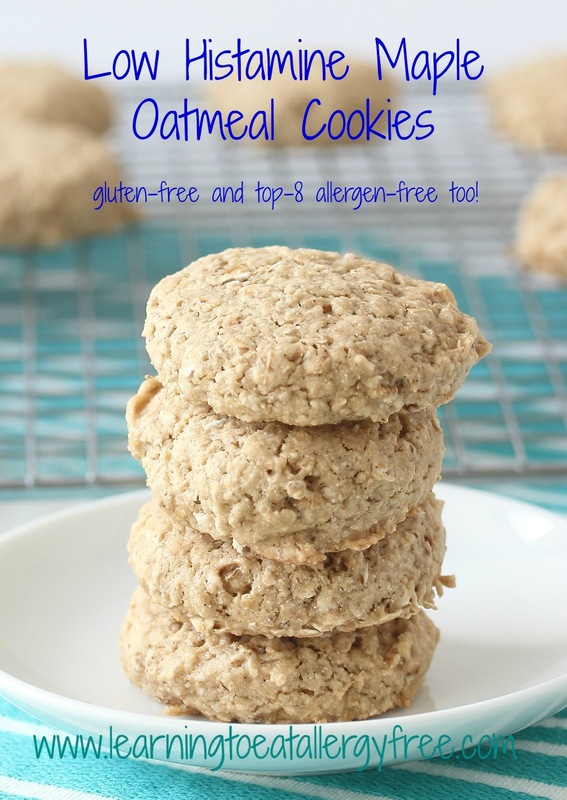 It fits the low histamine requirements – even down to using vanilla sugar in lieu of vanilla extract – and I think you will agree that it satisfies the snack craving. Combine the flour, xanthan gum (use this only if your flour blend doesn’t contain a gum), baking powder, and vanilla sugar in a medium bowl. Combine the oil, maple syrup and applesauce in a large mixing bowl. Add the dry ingredients and blend together well. Add the oats and blend for another 1-2 minutes. Scoop the cookies onto a baking sheet. Flatten the tops. Bake at 350 degrees for 15-16 minutes. To make vanilla sugar, combine ½ cup organic cane sugar with one whole vanilla bean in the bowl of a small food processor. Process until the vanilla bean is completely combined. 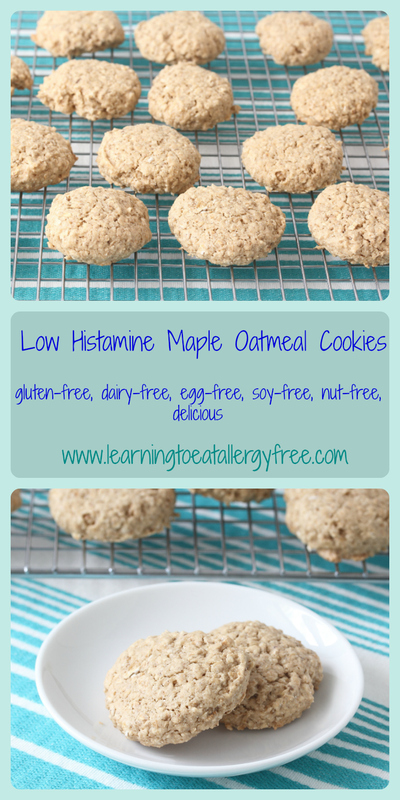 In addition to being low in histamine, these cookies are of course gluten-free, dairy-free, egg-free, soy-free, and nut-free. They have just a touch of crunch, and just the right amount of soft-baked. And they smell soooo good while they are baking!